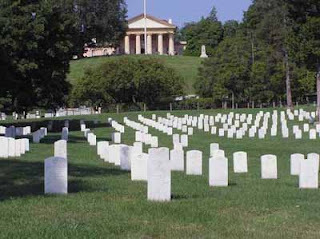 Arlington National Cemetery is the second biggest cemetery of the USA. It is located in the State of Virginia (close to Washington D.C.) and next to the Pentagon. It was founded during the American Civil War on the grounds of Arlington House. The cemetery is 2.53km² large and more than 300,000 veterans and military victims from the American Revolution up to the Iraq War are buried there (people who died before the Civil War were reinterred after 1900). There are many popular monuments in the cemetery, among which there is the Tomb of the Unknowns (formerly known as the Tomb of the Unknown Soldier). One Unknown Soldier per war is buried there symbolically for all the others (World War I up to the Vietnam War). The President represents his closest relative at the funeral and is given the American Flag. The Tomb of the Unknowns is constantly guarded by the 3rd US Infantry ("the Old Guard"). The fastidious ceremony of the Changing of the Guard is held every hour (every half hour from April 1 to September 30). The Tomb of the Unknowns is part of the Arlington Memorial Amphitheater which was built in 1868. State funerals, Memorial Day and Veterans Day ceremonies take place there. About 5,000 people attend these ceremonies each year. Another notable site is the grave of President John F. Kennedy. He is buried with his wife and two of their children. His grave is marked with an eternal flame. His brother, Senator Robert F. Kennedy, is also interred nearby. The latter's grave is marked by a simple cross. Then there is Arlington House (The Robert E. Lee Memorial). It is a Greek revival style mansion which belonged to the family of the Confederate General Robert E. Lee's wife. The grounds of the mansion were declared as the site of Arlington National Cemetery during the American Civil War. The United States has since designated the mansion as a National Memorial to the General Lee which can be visited. As for the burial procedures, the flags in Arlington National Cemetery are flown at half-mast a half hour before the first funeral until a half hour after the last one each day. Funerals are normally conducted five days a week - excluding weekends - and there are, on average, 27 burials a day.